Location: Derbyshire. 8 bedrooms, sleeps 8-26 guests. With Hot Tub, Games Room, Cinema Room, Wireless Broadband Internet and Grass Tennis Court. Perfect for families, corporate events or parties. A beautifully restored Georgian property originally built in 1690 with lovingly restored original features and all the benefits of modern technology and contemporary furnishings. Set in 1.5 acres of mature established gardens including a large terrace and a full size grass tennis court, there are 3.8 acres of paddock, stables and apple orchards to be enjoyed. The house sleeps 8-26 people throughout the eight bedrooms (a further two dressing rooms which can also sleep an additional four if needed). This really is a luxurious house boasting a 12-foot swim spa/hot tub, games room with pool table, a cinema with a 3-metre wide screen, 100-foot master suite, exquisite bathroom, two of which have spa baths, plus four reception rooms. The accommodation is vast with lots of secluded and communal areas including two living rooms, a snug and orangery. Entrance hall: there are two spacious entrance halls to meet and greet guests. Sitting room: there are two sitting rooms with beautiful views over the courtyard and the gardens. Dining room: large 10-seater antique table and sideboards. Kitchen: along with adjoining orangery, they form the heart of this home, offering both a breakfast bar and full dining area. Handmade, bespoke shaker solid timber kitchen with a central island, Star Galaxy granite work-surfaces, range cooker with induction hob, full size American fridge freezer, two integral dishwashers, double butler sink, instant hot water tap, integral steam cooker and warming drawer, solid oak floors, Victorian leaded light windows, multi-fuel stove, TV and internet point. Perfect for entertaining! There is a large dining table which comfortably seats 22 people. The handmade solid timber Orangery is fully double glazed, south facing, and creates an amazing room that can be used all year round, offering wonderful views of the terrace and gardens. Two sets of French doors lead to the terrace and gardens. Games room: with a full-size pool table. Cloakrooms: two cloakrooms with a W.C.
Snug: the oldest part of the house, dating back to 1690. Original exposed beams, travertine floor and Victorian windows. Cinema: a home theatre with eight reclining seats, a 9.1 surround sound speaker system. A range of Blu-rays are available, or you can of course bring your own. Master bedroom suite: 100-foot long with two dressing rooms and an en-suite bathroom. One of the dressing rooms can also be used as a further bedroom (double bed sofa) or nursery. The magnificent master bedroom benefits from original exposed beams, Victorian open fireplace and dual aspect views through Victorian leaded light windows, over the courtyard and gardens, internet point and is set up with 5.1 surround sound TV facilities. The en-suite has been designed for two. There is a double Jacuzzi whirlpool bath, a walk in double power shower, double sink and vanity unit, WC and airing cupboard. Ceramic tiled floor and Victorian leaded light windows overlooking the courtyard. Kids room: once the apple store, this room is perfect for the kids; it sleeps six and has access from the spiral staircase in the formal living room. Three further large bedrooms, two with Victorian fireplaces. These rooms can be one super-king or two singles. Two further bathrooms on the first floor, including an oversized Jacuzzi whirlpool bath, a walk-in double power shower which is also a steam cabin with foot massager, double sink with fully fitted units and granite surfaces, WC and airing cupboard. Ceramic tiled floor, original Victorian fireplace and leaded light windows overlooking the courtyard. Three bedrooms that can be used as doubles or for two people sharing as singles. Large landing with a double sofa bed for additional sleeping if needed. Approximately 1.5 acres of formal gardens including a full-size grass tennis court. Approximately 3.8 acres of paddocks and fruit orchard. Spectacular country views. Three garden tables and benches. Reclining garden chairs. Prices for 2018 bookings for up to 26 guests including VAT. Bookings for 2019 will be at different rates. Accommodation is excellent, wow factors include cinema room, hot tub and huge master bedroom. We had a fantastic and memorable stay, my friends and I want to come back, excellent venue. Really good time, only wish we could have stayed longer. We all had an amazing time. The facilities and level of comfort and entertainment were wonderful. The property is set in a quiet, private village location. The old market town of Ashby de la Zouch is 5 minutes away and Birmingham, Leicester, Burton upon Trent, Derby and Nottingham are all less than 30 minutes away. 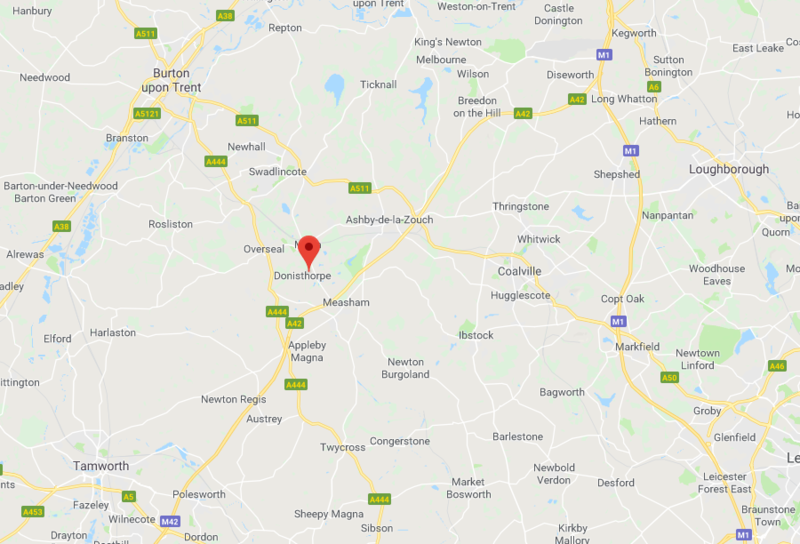 The village is very well placed for connections to the M42, M1, M6 and M40 motorway networks and East Midlands Airport and Birmingham Airport/International railway station are both about 20 minutes away. There are three trains per hour direct from Birmingham International to London Euston which takes 70 minutes.